Description: Contact and vapor corrosion inhibiting additive for aluminum and ferrous metals: offers good protection in a salt environment. Post add to coating with slow mixing. 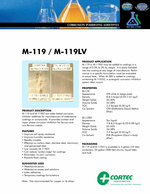 A 3/1 ratio of M-380/M-119 provides for a synergistic additive blend. These additives must be added separately to the coating. Package: 5 gallon (19 liter) pails and 55 gallon (208 liter) drums.